Can Hair Products Cause Hair Loss? Home > Women & Hair Loss > Can Hair Products Cause Hair Loss? Most people, particularly women, regularly use a variety of different hair products on their hair. From hair sprays and leave-in conditioners to gels and hair dyes, these products provide numerous benefits for healthy hair, but they can also cause damage to the hair strands, or Hair Loss, if used too often or in too large of amounts. Hair Dye – this is one of the top hair-loss causing products you can use on your hair. The harsh chemicals that most Hair Dyes contain will often have severe after-effects that can lead to the loss of hair. These chemicals can dry the hair strands excessively, result in split ends and ultimately cause some hair loss in many people. Perms – also known as a permanent curl, perms can cause hair loss in some people, especially if the hair wasn’t in good condition before the perm was given. Hair loss can also occur after a perm if the person giving the treatment is untrained in the procedure and doesn't follow the directions exactly as listed on the kit. Hair loss from a perm occurs when the solution is left on the hair too long, when too much solution is used, or when the chemicals in the solution are too strong for the individual's hair type. Aside from these two common hair loss culprits, other styling tools, such as hair sprays, styling gels and holding creams, can also cause hair loss. If these products are used too often, if they are allowed to build up on the hair strands, or if they are used in excessive amounts, they can weigh hair down, dry it out or weaken the strands. When this occurs hair strands can break, split and fall out. The result is premature thinning of the hair or hair loss. The first step to repairing the damage that may have been done to your hair by any type of hair product is to immediately stop the use of the product. Then, try to concentrate on hair repair. Consulting with a professional hair stylist is often the best solution, as they can examine your hair and give tips on ways to strengthen hair, promote new hair growth and reduce future hair loss. Another way that you can help reverse hair loss due to the use of styling products is to cut your hair into a shorter style. This type of cut will remove the damaged sections of hair and reduce the weight of dead hair that can lead to increased shedding. 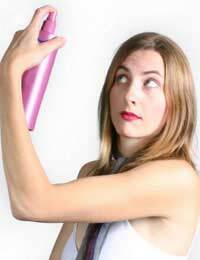 If you must use hair products, you can take steps to reduce hair loss. Always choose products that are based on natural ingredients. These products contain fewer harmful chemicals so they are less damaging to your hair. Avoid using products that contain alcohol as these can dry out hair strands, and opt instead for products that offer hydration and conditioning of the hair strands. For even better results, you should use a shampoo that is formulated for deep cleaning so that products are stripped from your hair strands each day and chemicals are not allowed to build up and cause damage. If you must change the colour of your hair, choose a temporary dye or one that is formulated with natural ingredients. These hair colouring solutions are not as harsh and will not result in the same type of damage as chemical hair dyes. To further avoid hair loss from hair colouring you should always have the treatment done by a professional stylist. This way you can reduce the occurrence of errors that lead to hair loss. If you love the look of curly hair but need to avoid a permanent, you can opt instead for a gentler body wave and the application of hot curlers. Although this procedure is more time consuming the damage that you avoid from the perm will save you from premature hair loss. Finally, the best way to avoid hair loss from hair products is to give your hair a break and leave it untouched and natural at least two days each week. By leaving your hair in its natural state, you will allow the strands to breathe better and make better use of the nutrients supplied by your body. After a few untouched days you should notice an increase in the health of your hair. After a few weeks of going natural you will notice a decrease in hair loss. For more information about the effects of dying your hair, read our article Hair Dye Allergies And Hair Loss on this site. I have a very growing concern here and would like to hear your expert advise. A month ago, I noticed the each time I combed my hair, the amount of hair coming out was a lot and I have been growing concerns. My hair is starting to get thinner and I am beginning to stress. I am planning to get a hair cut however, my concerns are that it might not grow back. I now brought a Garnier Ultimate Blend shampoo, conditioner and serum which says help and protects fragile hair from breakage. I know its very early stages but I've never experienced this in my 33 years so I am overly concerned. My other thoughts are that I've been to hairdressers late January and got my hair texturized and thinking it might be the cause of it. Please note that my hair type is aftro. Unfortunately you will have to visit a hair care specialist to ascertain whether the texurizers have caused any hair loss. It's not something we can advise on. I have a very growing concern here and would like to hear your expert advise. A month ago, I noticed the each time I combed my hair, the amount of hair coming out was a lot and I have been growing concerns. My hair is starting to get thinner and I am beginning to stress. I am planning to get a hair cut however, my concerns are that it might not grow back. I now brought a Garnier Ultimate Blend shampoo, conditioner and serum which says help and protects fragile hair from breakage. I know its very early stages but I've never experienced this in my 33 years so I am overly concerned. My other thoughts are that I've been tohairdressers late January and got my hair texturized and thinking it might be the cause of it. Please note that my hair type is aftro. The beauty industry benefits from consumers hair loss re: hair regrowth industry.